The story is one of those rare magical ones that came to me whole. I was attending the Centrum Writer’s Conference which I like to do every summer. There, in a wonderful setting on Puget Sound, I meet with some of my best friends to write and share stories, to talk about writing, books, business, and life...and to play. One day in 1991, as I walked alone along the beach, enjoying the sights, sounds, smells and feel of my surroundings, it all started shaping itself into words in my head. But walking on the beach isnt enough for a story, I told myself. Still, it felt so magic. The otter was there, and the peeper birdsactually black oyster catchersand the ferry boat, the song of the bells on the buoys, the barnacle rocks and the smooth rocks. All of it just begging to be put into a story. What if... I thought, as I turned around to walk back, what if it was a story of someone who couldnt walk with her legs? By the time I got back to my little cubby-hole room in the dormitory, I couldnt wait to get my hands on pencil and paper to put the words down. I skipped the next session to do it, then read my first draft to my husband, then to a friend who had a couple small suggestions. A few days later I shared my story with the whole group. They liked it. Back home the next week, with my daughters wedding and a cross country move demanding my attention, I read my story over. Then without letting it sit for a while, as I usually do, or even taking time to make rough sketches in the dummy, I put it in the mail to one of my publishing companies. I mailed it on Monday and got the acceptance call on Thursday, only the second time that has ever happened in my career. Some minor changes were made in the textto take out the cuteness my editor saidbut it is published very much as it first came to me as I walked on the beach. The illustrations were started the following spring. I had some pictures from the beach but I needed the people. I recruited a young friend, Josh Croston, then five years old, and Barbara Swancara, the wife of one of my husbands coworkers who said she wouldnt mind if I added wrinkles and white hair. I rented a wheelchair for a day and set up a sunroom and beach scene in our large unfinished bedroom. I photographed Josh and Barbara with the wheelchair and pretending to be on the beach. Using the photos for reference I sketched all the pictures for the book, showing Gramma and Donnie with the wheelchair on one side, and on the beach doing all the things they talked about, on the other side. My editor, Susan Hirschman, sent the sketches right back. Gramma cant walk, she said. How can you show her suddenly out of her chair? She was right, of course, so even though my sketches were very nice and Id worked hard on them, I put them aside and started over. This time I showed what Gramma and Donnie saw without putting them in the pictures. It is much better that way, and Im glad Susan had me do it again. That summer I returned to Centrum with the drawings to work on. I love the soft muted colors of the beach and decided to use colored pencils to capture them. My art director, Ava Weiss, suggested I color the pictures with felt markers first, to soak into the white paper so no little white dots would show though. I dideveryplace except the sand where I wanted the white for rough texturethen I colored with the pencils, layering over and over until the colors were as solid as I could make them. You may have noticed the feathers on the dedication page and the end papers. I drew only one and the designer used it over and over to make those pages. As you can see, though, its mostly my book, I had help from quite a few people to make it as nice as it is. Personally, I think its one of my prettiest ones. With a combination of storytelling and imaginative play, a boy and his Gramma pretend they're walking together at the seashore. She's in a wheelchair; his head is in her lap; together they take a walk where they have been before and make it new. 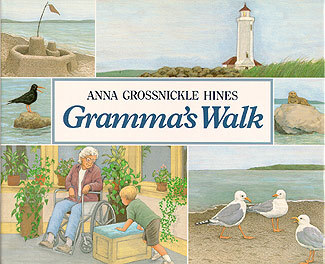 The text is on the left hand page, along with a small picture that shows Donnie and Gramma playing their game; filling the right hand page is a realistic, delicately textured scene in watercolor and colored pencil picturing what they imagine on their walk at the beach. The experience is precise and physical, including details of sound and touch as well as what they see: the waves lapping the rocks, the warm sand on the beach, the peeper birds, an otter, a shell. "See it," they say to each other. The intimacy and shared adventure has the appeal of stories and games done over and over. Kirkus Reviews , September 1, 1993, Copyright ©1993, Kirkus Associates, LP. All rights reserved. Donnie and his grandmother, who is in a wheelchair, take an imaginary walk on the beach. Realistic, softly colored watercolor and pencil illustrations juxtapose the dreamers and their vivid imaginings on opposing pages, effectively creating a warm, loving experience for the boy and Gramma. Donnie's Gramma gets around in a wheelchair, but through the magic of imagination, the two of them walk to the beach, listen, feel, and smell the sea; identify prints in the sand; and admire the wildlife. The wake from a passing ferry collapses the sand castle they build, leaving only the flag and footprints when they head for home. "You know what, Gramma? Donnie says. Youre the best walker in the whole world." Soft-lined, muted watercolors and colored pencils create pristine, full-page seascapes. No big deal is made of Gramma's condition, nor is the reason for it given; what comes through is total acceptance and intergenerational love. A warm and wonderful story for helping children understand aging, much like Tomie dePaola's Now One Foot, Now the Other (Putnam, 1992), and Sally Whitman's A Special Trade (HarperCollins, 1985). Anna Grossnickle Hines has a positive genius for using words and pictures to craft wonderful stories from daily family life. Her latest book, Gramma's Walk, is one of her best. As a young boy sits by his grandmother's wheelchair, she uses words to take them on a "walk" along the beach. Hines' text is sweet without being amarmy, and her illustrations have a delightful warmth. The book shows imagination at it's best. When Donnie goes to visit Gramma, she is sitting in her wheelchair. She asks him where he would like to go for a walk and he chooses a favorite path down by the beach. As he settles down on a pillow next to Gramma, she takes him on an imaginary journey to the beach. Gramma's tour is thorough as she describes the sights and mimics the sounds of the seashore. The book is a tribute to the imagination and is a treasure for any family library. 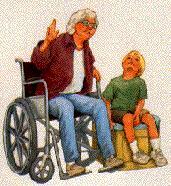 Donnie finds Gramma sitting in her wheelchair in the sun parlor. "Where shall we walk today'? Gramma asks him. After thinking Donnie decides they should walk the seashore and this begins an imaginative walk along the shore. Gramma provides the sounds of waves, birds and animals. Donnie takes part in the walk by adding comments about what Gramma sees and tells her of the things he imagines doing and seeing. The watercolor and colored pencil illustrations show what the two are imagining. This is a warm story of two people who care for each other and have developed a wonderful ritual of sharing, When it is used as a read-aloud book, young listeners can share and enjoy the walk. 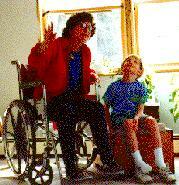 Not every child has a gramma confined to a wheelchair, but every one of them has a rich and willing imagination, and I just hope that like Donnie's gramma I will find the time to share the wonders of our world with my grandchildren. Anna has done it again. Another quiet and warm book about making the best of a situation. Tricia Gardella, Union Democrat, Sonora, CA, February 1994. A delightful journey taken by a boy and his Grandmother. Even though Gramma is confined to a wheelchair, she 'travels' to a lovely beach with her grandson who has come to visit. She paints a picture in words as they travel over the sand, dipping their feet into the chilly sea water while watching the sea gulls, an otter, and building sand castles that are swept away by the waves. The reader can feel the warmth of the sand, the roughness of the barnacle covered rocks and the cool sea breeze as gramma weaves her tale. This is a delightful book with soft watercolor illustration which together with the story make for a subtle look at the power of love between young and old.